A workbench might just be the one tool that is truly universal. Regardless of what kind of job you are doing, you will probably need a work surface at least once. When we consider this fact, it seems odd that we don’t see portable workbenches any more often. After all, convenience usually makes for universal popularity. Today we will take a look at two of the most popular folding work benches on the market. We have tried to evaluate every aspect of these products from top to bottom in order to ensure that we give you, the reader, the best possible bank of knowledge from which to base any buying decision that you might make. To put it another way: We did all this to keep you from wasting your money. The Worx Pegasus is a pretty unique workbench, as it is designed to function as either a sawhorse or a standard work surface. In some ways, this bench might be likened to a transformer in the fact that it fulfills more than one function with just a little bit of folding and snapping. It works like this: To convert the Pegasus to a sawhorse, you just press a button and fold both sides down. A flat surface will remain on top so that you can lay a piece of lumber across and saw as needed. Right now, you might be thinking the same thing that we are thinking: Aren’t sawhorses normally used in pairs? 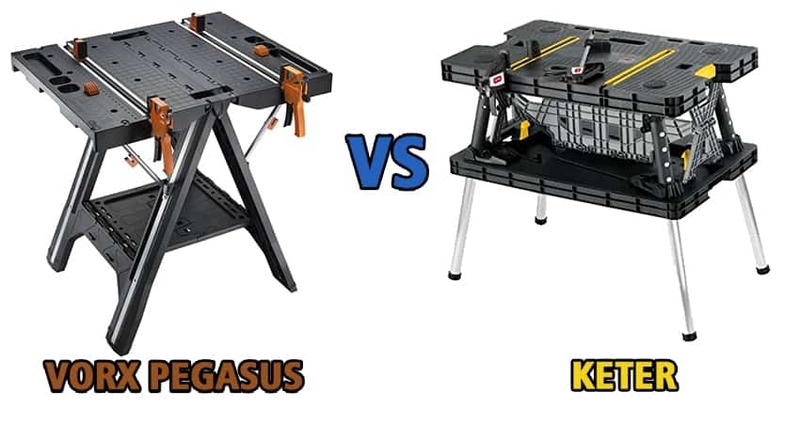 Well, the people at Worx seem to have considered this fact, because the Pegasus can easily be linked with a second table to expand your workbench. This means that you have two sawhorses and a very large work surface, with a level of portability that would not otherwise be realistic. Folding the Pegasus for travel is also a very easy process. You just lift on the bottom platform and push the legs inward. The whole thing folds up in a very convenient way. One of these benches is about five inches when folded. It is relatively easy to tuck one under each arm and walk a short distance from your truck to the work site. My only complaint is that these benches are a little bit too tall when you fold them up, forcing you to carry them in a slightly awkward position. We wouldn’t want to carry two of these things for more than about 50 yards, even though they aren’t particularly heavy. Even one of them could be a serious encumbrance for those who need to walk a long way from the vehicle to the job. In terms of weight capacity, this one made me feel slightly worried when we first examined its construction. It just didn’t look that strong, but it is rated for up to 1000 pounds, so it should be strong enough for any woodworking. Honestly, if you are working with something that weighs more than 1000 pounds, you will probably need some heavy equipment to move it around, and this bench won’t be the right tool for the job. Price is a concern for most buyers, and the Pegasus isn’t really a bad deal. For the decent price, you get a versatile and portable tool that will help to make all your other tools more effective. You probably have tools in your garage that are more expensive than that. We think it is very impressive to see that this bench has a fold-down surface while at the same time maintaining such a high weight capacity. This is probably not an easy engineering feat when you consider that any collapsible surface is likely to be weaker. This is mostly accomplished through the large metal arms that brace the table from underneath and prevent it from buckling until you are ready to turn it into a sawhorse. When folded, the clamp mechanism fits neatly into the recess under the bench, making it less likely that you will snap the tool on objects that you may pass. If you are working out in the country where you need to worry about brush snagging your tools, this is another small bonus. It’s also a plus if you need to carry your folded bench through a crowded area. If you work within the limits of a crowded city, you certainly don’t want to start trouble needlessly. One of the main advantages that we see when we look at the Pegasus is the fact that it has four clamp dogs. If you don’t know what a “clamp dog” is, we will explain. These are the smaller tabs on the other side of the clamp, which help to balance the material and hold it in place. Most benches only have one clamp dog per clamp. This one has two per clamp for a total of four, which helps a little bit when you are trying to hold something as straight as possible. The surface of the workbench is more or less flat, but it contains a few hollowed-out places where you can put screws, nails, and other small items that you don’t want to lose. The bottom platform also functions as a convenient storage shelf where you can place larger tools and other items. Since you need to push this shelf upwards in order to fold the bench, the weight of some tools can serve as a useful safety measure. By loading this bottom shelf, you can ensure that the bench will not accidentally snag on your foot and collapse at a bad moment. This workbench does not offer a particularly large surface, so it may not be suitable for cutting certain larger pieces. This may have been why the Pegasus was designed to serve double-duty as a sawhorse, as this is the only way it can realistically be used to cut large pieces of timber and decks. That being said, there are a few complaints with this bench, and at least some of them are valid. First of all, this bench offers relatively little flat surface area. The entire bench is more or less flat, but if you need a perfectly flat surface, this bench will frustrate you. This bench was clearly designed to hold an item as it is being cut or otherwise altered. It is not meant to provide a totally flat working surface. This might make it useless for some applications. For instance, a jewelry maker would probably find this bench to be of little use. Small-scale metalworking would also be a bad thing to do with this bench, as its’ surface is not suitable for hammering. This is a unique workbench that is clearly designed for speed and convenience above all. When you look at this thing, it looks high-tech. In fact, it kind of looks like something you would expect to see in a science-fiction movie. It delivers on that appearance when you see how it works. All you have to do is depress the two buttons on the sides, and this bench drops all of its parts into place with no effort from you at all. By using gravity and the weight of the bench as part of the design, Keter has created a bench that can be set up in as little as two seconds. This is really nice for those who work on tight schedules and those who just want to save as much effort as possible. As if that weren’t enough, it’s very cool to show your friends the way in which this bench can be deployed within seconds. Sure, this doesn’t really affect the functionality, but who doesn’t like to look cool? This one offers a relatively flat surface, mostly because it doesn’t fold down in the same way that the Pegasus does. While the Pegasus drops its “wings,” this one is simply stuffed back into its base. Obviously, it requires a little more effort to fold this bench up than it does to set it up. However, this isn’t a big deal when you consider that the bench can be set up within a few seconds. You would think that a bench like this would be very expensive, but you would be wrong. Keter is a little bit cheaper than the competition. Although this may not be a huge concern, it might be that last thing that tips the scales in favor of this product. When you fold this one up, it becomes a conveniently-shaped object that is about the size of a large suitcase. This makes it very easy to pack, and you also don’t feel silly when carrying something like this. Since the weight is kept down to a very reasonable level, you should have no problem carrying two of these things at a time if you go with this model. The carry handle alone puts it slightly above the competition in terms of portability. One of the ways in which this product keeps its weight to a minimum is through the use of aluminum legs. Although the aluminum is thick and solid, it remains much lighter than steel or wood. That being said, we probably wouldn’t try to get anywhere near the 1000 pound limit with legs made of anything but thick steel. We doubt that most people would ever want to put that much weight on a bench like this anyway. We have some questions about the durability that is offered by this product. In general, we feel that there is too much plastic and aluminum here, and not quite enough steel. This means that you would not want to use this thing on a daily basis. It would be best to use this as a home bench and travel with it when necessary. Repeated and vigorous use of the drop-down mechanism will probably lessen the lifespan of this product. This bench has a shelf on both sides, which is conveniently located so that you can retrieve tools, screws, bolts, etc. without any need to bend down or contort. Everything is right there in easy reach. Another great thing about this bench is the fact that both clamps are moveable. By this, we mean that they can be mounted either horizontally or vertically. This adds an extra level of versatility to this product. The only problem with this shelf is that the center support divides the shelf in two, meaning that you can only utilize half the space at one time. If you want to store things on the other side, you will then have to walk all the way around the bench when you need that tool. A slight inconvenience, but not too bad at all. Overall, the Keter bench delivers in all the key areas. However, some buyers have made a few complaints. The main thing we are concerned with is durability over time. The way this mechanism works is very convenient, but at the same time, it is meant to be used roughly. Although the product is made in a sturdy and robust fashion, we are a little suspicious of “slam” mechanisms that don’t involve steel parts. This bench has a very wide surface area, allowing for greater control and the ability to work with larger pieces. Since this bench also weighs a little bit less than its counterpart from the previous section, the increased surface area is definitely a plus. When we look for negative reviews of this product, we find that most of them confirm this suspicion. Most of the negative reviews that we were able to find speak of the legs breaking, jamming, or otherwise failing to deploy. With such a complicated design, all it takes is one little problem to remove all functionality. That being said, the Keter bench gets very good reviews overall, and this is probably the case for good reason. These two products have a lot in common, so it isn’t easy to compare them and declare either of them to be the best. However, we need an answer for this question, so let’s do an in-depth comparison of these two products and determine which is the better of the two. In terms of weight capacity, we have a dead tie. Both benches are rated for loads up to 1000 pounds. In both cases, I would not suggest that you test this limit, since actual performance may vary. When companies put “performance numbers” like this on their products, they tend to give you the biggest number that they can logically justify. This means that the bench has a weight capacity of up to 1000 pounds. Don’t forget about this crucial fact. 1. What good is a single sawhorse? 2. Do I really want to carry two of these things? That brings us to the weight factor. This is a portable workbench, so lightweight is a good thing as long as the quality is not sacrificed. Neither of these benches seems to have sacrificed too much in terms of durability, but the Keter bench is 5 pounds lighter. In terms of portability, the Keter would get a slight edge just because of the convenient way in which it folds. The Pegasus is a little bit awkward (though to be fair, it isn’t extremely bad). I think it would be much easier to carry two Keters than it would be to carry two of the Pegasus tables. In terms of durability, the Pegasus gets the point. This is mostly because of the complicated mechanism that allows the Keter bench to be deployed so easily. With so many moving parts and very little steel in the device, this mechanism seems like an accident waiting to happen in some ways. This might be an exaggeration, but the Pegasus definitely looks more trustworthy in terms of how long it will hold up over time. When we look at the size of the available work surface, the Keter bench gets another solid point because it offers a surface that is significantly larger than that of the Pegasus. The difference in table size between these two models isn’t even close. If you need a wide surface, the Keter is clearly the better choice. The Pegasus should get some credit here for the ability to link more than one of them in a series, but that will also double the weight and the setup time. Finally, we come to the clamps. We have saved this subject for last because not everyone chooses to use these things. Depending on your preferences, you may end up removing these clamps and putting them away. If you are not one of those people, the Pegasus is probably more like your style. The extra clamp dogs might not seem like a big difference, but they do add a little bit of extra control when you are doing a difficult job. If you weren’t interested in maintaining perfect control over your tools and materials, you probably wouldn’t be investing all this money in a workbench. As such, the Pegasus gets a solid point in this department. So, which workbench is better? So, at the end of our epic matchup, we see that the Pegasus has 2 points while the Keter has 4 points. Although this was a very close matchup between two products that do a great job at performing the same function, the Keter does seem to have slightly superior specs. One of the reasons for this decision is that the Keter’s main downside is a theoretical one. We are assuming that this mechanism will have durability issues over time, but we don’t know for sure if that is the case. The Keter also offers a higher degree of portability and convenience, which really is the most important factor for a workbench of this type. If you are looking to buy a portable workbench, there is no doubt that convenience and easy travel are at the forefront of your concerns.